My latest Daily Caller piece (in quite a while, actually) is actually a modified LCR post but due to the real estate, it sounds a lot better than it does here. Location, location, location. Click the image above to read the piece and please Facebook "like" it and comment if you have the time, please get the word on Obama's march to socialism and in this case, death panels. Let the new 112th Congress know your outrage over this insidious move on Dear Leader's part. Props to RightKlik for much of the inspiration! 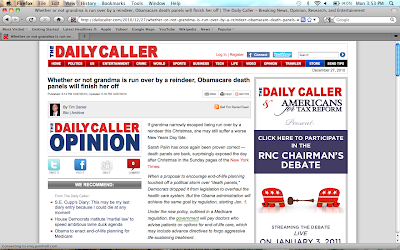 Great piece at Daily Caller. I "liked" it:-) Do Democrats out there get it that their elected are devious cheats? The Executive Order and regulation actions are way out of hand. We don't need a congress if our King is going to deem things done.